Every month we spend an evening scouring the pages of the latest issue of Previews and pick the titles we are looking forward to the most. This month it's the November issue which includes comics scheduled to ship in January 2018. James R: Has 2018 peaked already? When Jeff Lemire announced his return to DC, this was the title that I was most excited about; a series that seems closest to the Fantastic Four in spirit, taking a group of DC's heroes - Mr Terrific, Plastic Man, Metamorpho and Phantom Girl - and putting them on a galaxy-spanning quest to return home. With art from Joe Prado, I am ridiculously excited for this book. Adding to my fanboy joy, Previews reveals that the story will bring in Alan Moore's Tom Strong from the America's Best Comics universe! It's safe to say that this will be a permanent fixture on my pull-list! Jo S: Saladin Ahmed has secured my respect as a writer this year with his work on the (much underrated, in my opinion) Black Bolt series this year and, I can’t deny, following him on Twitter; I kind of like the cut of his jib, so it’s interesting to see he will be shortly launching his own new series. Elena Abbott is a journalist in 1970s Detroit, Ahmed’s home town, investigating a series of grisly crimes the police have ignored, including the death of her own husband. I’m hoping that Ahmed’s mix of wry humour and pathos are realised to the max here. 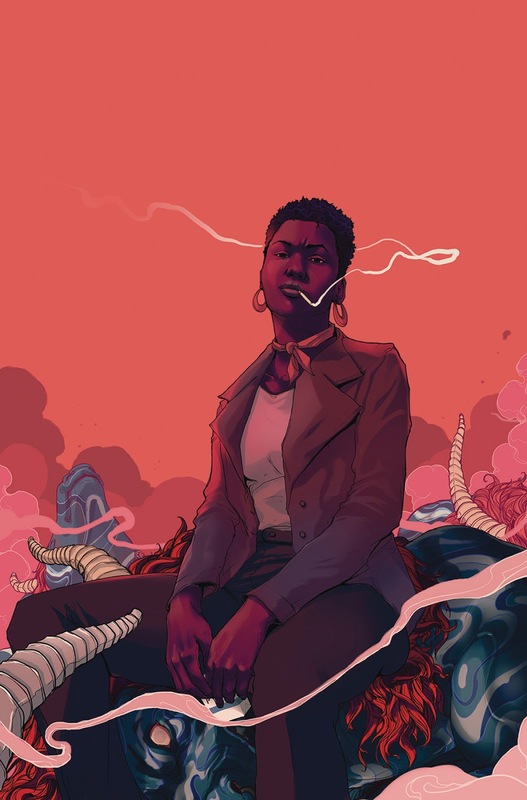 Sami Kivelä does the honours on the artwork and I already like the style of the cover with its blend of ordinariness - a woman, sitting, a little slumped, smoking - and what-the-heck-ness - are those dragons? Matt C: Aleš Kot is one of the most interesting and provocative writers working today. Sometimes his high concepts may feel like they escape from his grasp a bit, but generally his ideas are always worth investigation. The spiel for this features the phrases ‘police state’, ‘guerilla war’ and ‘white supremacy’. 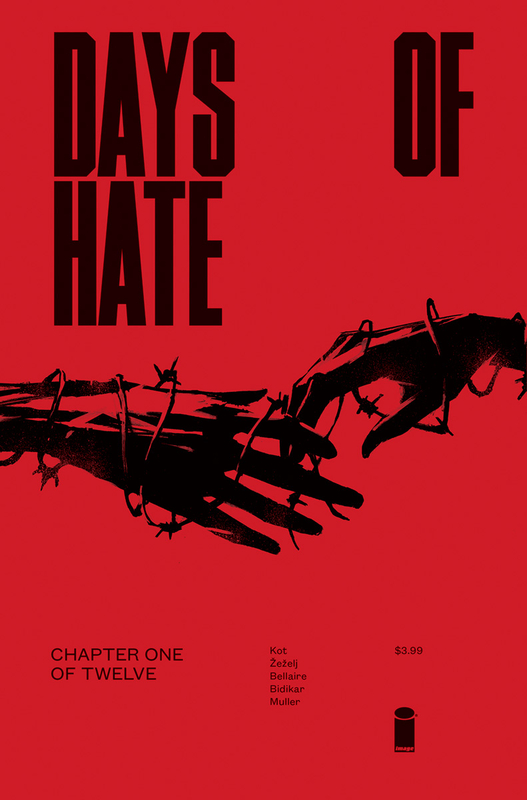 Kot is never one to turn a blind eye to the current political climate, and jumping four years ahead into the future indicates he’s envisioning how things could turn out in a worst case scenario (which is certainly supported by the title, Days Of Hate). Definitely one for readers who like tales that don’t shy away from the depressing realities of modern day life. Andy H: One of my all time favourite titles gets a 30th anniversary spotlight in the first X-Men Gold Annual. Excalibur, possibly the epitome of misfit heroes are back! 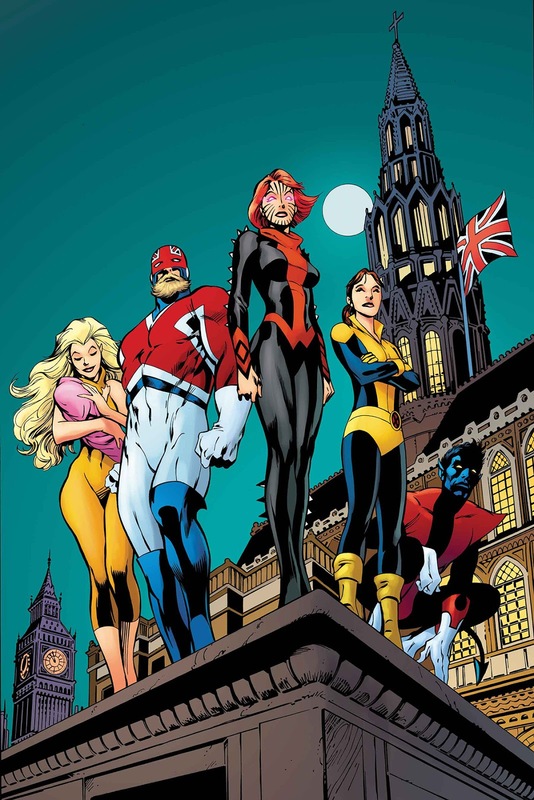 Captain Britain, Meggan, Nightcrawler, Phoenix and Shadow Cat reunite for the first time in years. Back in the day, Chris Claremont and Alan Davis made this a must-have for me and put Davis high on my all time fav artist list, where he still remains. While I doubt this one-off will reach the dizzy heights of excellence Excalibur saw in its heyday, it will be great to revisit old friends and catch up. Just who (or what) is the bundle that Meggan is holding? All this wrapped up in a cover by Davis paying homage to his original issue #1 cover - what's not to like? James R: This is one of those books where the pitch alone sold it to me. 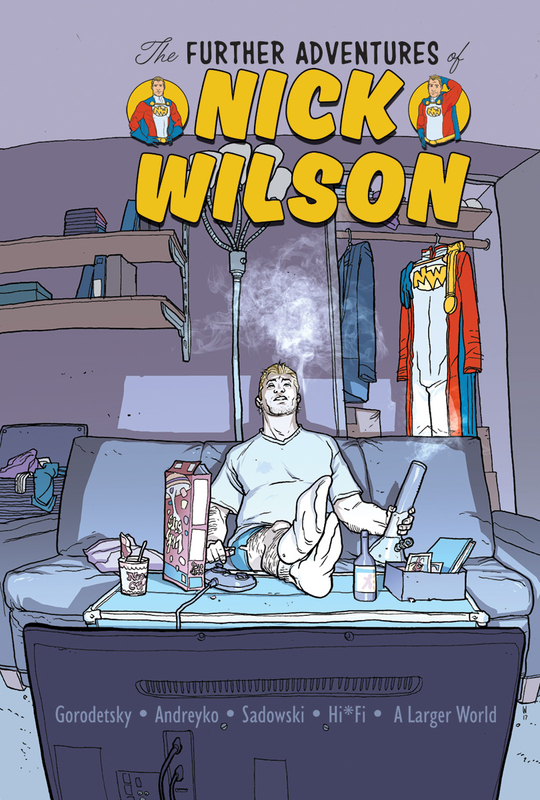 Nick Wilson used to be a superhero, but when his powers started to fade, so did the fame and adulation that went along with the job. This story asks what happens when you lose the very thing that defined you, and I love tales about a decline and fall. 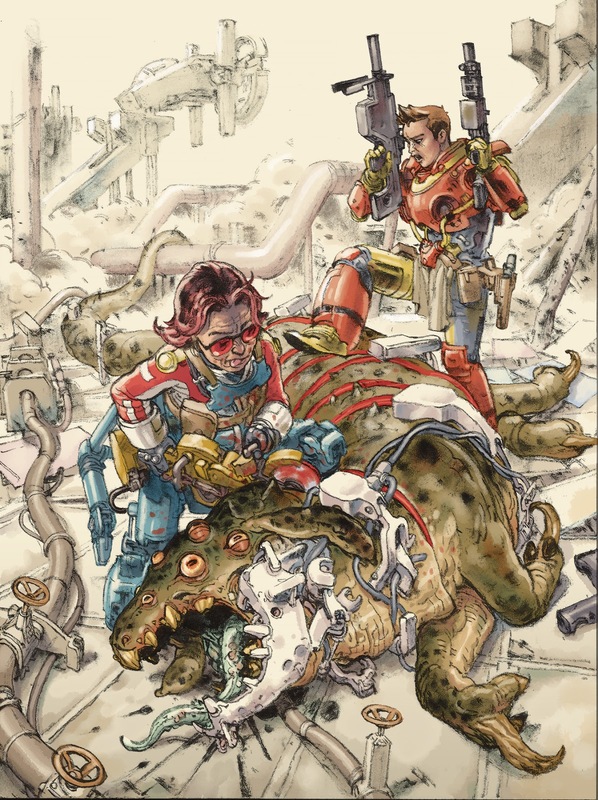 Written by Eddie Gorodetsky and Mark Andreyko, with art from Steve Sadowski, this looked like February's most original new release, and I'm looking forward to following Nick Wilson through the wreckage of a post-super life. Jo S: Hoo-hoo! 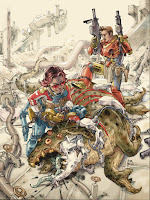 Si Spurrier doing blacker-than-black comedy about a futuristic mother and daughter bounty hunter team who don’t get along but are forced to work together? A world where bounty hunters are super-celebrities famed for freeing society from high tech interdimensional über-criminals? Shut up and take my money! If there are robots in it too, man, I’m giving up everything else next year to make space for this one. Spurrier has produced one of my favourite series this year, Godshaper, and his ability to create substantiated other-worlds, with rules of reality which stretch the imagination but are fully credible, was fundamental to my enthusiasm for this series. The addition of Rachael Stott on art duties just makes this even more irresistible. Andy H: My reading list has been lacking a bit of Peter David recently so seeing this miniseries in the January listings should correct that. I remember (fondly) the original BSG TV series and enjoyed the updated version. Now, through the magic of comics, the two will meet head on! So many questions: How? Why? Will there be a daggit? What will the original Starbuck do when he meets his female counterpart? Uh-oh. Peter David knows his sci-fi and has a great way with team dynamics. 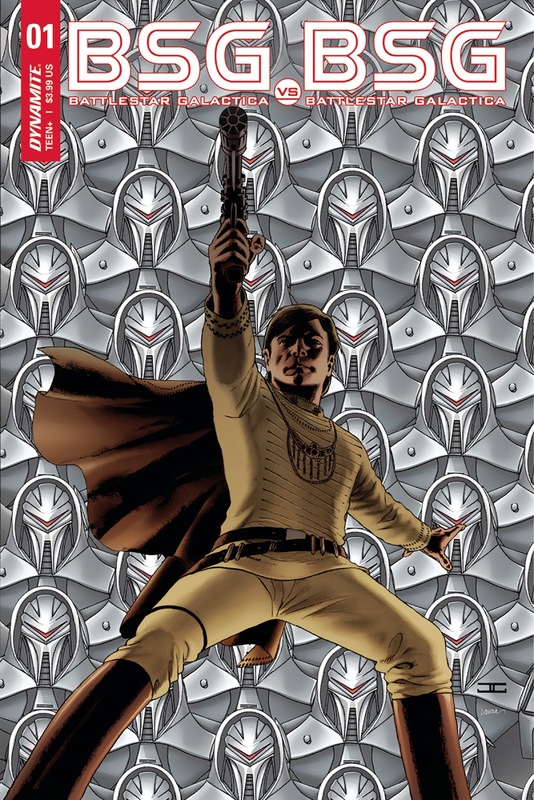 He should be a perfect fit for all the comings and goings as old meets new and they must face a common foe, the Cylons. Hopefully this should be a great start to my 2018 pull-list. James R: I would pick this up purely as it's a Tom King book - he's established himself as one of the medium's leading lights - but there's plenty to look forward to in this 'winter special'. 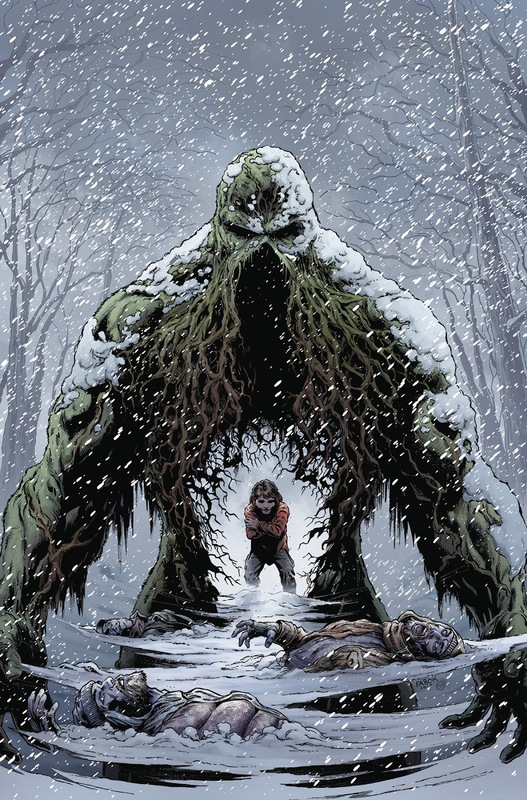 King showed that he had a great take on Swamp Thing in the superb Batman #23, and the promise of an extended done-in-one story illustrated by Jason Fabok is irresistible. This issue also features the final script written by Swamp Thing co-creator Len Wein before his untimely passing in 2017, so this should be a fitting tribute to the industry great too. The Paradox Comics Group are a collective of comic book connoisseurs who all frequent the esteemed retail establishment Paradox in Poole, England. Their tastes in the sequential art medium are wide and varied but they all possess an eternal fascination at the prospect of spandex-clad muscle men punching each other in the face. The views and opinions expressed herein are those of the individual authors and do not necessarily reflect those of the staff of the Paradox shop and/or the other authors on this blog.